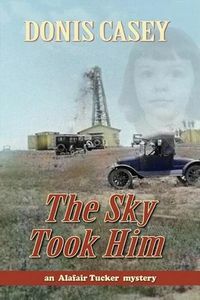 The Sky Took Him by Donis Casey: Synopsis and Online Purchase Options. Synopsis (from the publisher): It's a sad duty that brings Alafair Tucker to Enid, Oklahoma, in the fall of 1915. Her sister Ruth Ann's husband, Lester, is not long for this world, and the family is gathering to send him to his reward. Alafair had planned to make the trip on her own with her youngest daughter Grace. So she is surprised and gratified when her eldest daughter Martha volunteers to come along and care for Grace, freeing Alafair to comfort the soon-to-be-bereaved. But her niece's irresponsible husband, Kenneth, has disappeared at a most inconvenient time. When it comes to light that Kenneth has been involved in some shady dealing with Buck Collins — the most ruthless businessman in town — everyone is convinced that Collins has done him in. In fact, no other possibility is considered, not by the family or by the local lawmen. But Alafair suspects that things are not so simple.